In the words of Kevin Costner, “If you build it, they will come”. In the case of Melbourne nothing could be more accurate. Last weekend I took my ten-year-old sports mad son to the Victorian capital. It was a first for both us – he had never been there before and neither had I in a non-working capacity. For over two decades I travelled regularly from Perth to Melbourne as a broadcaster and commentator. Last weekend I went simply as a punter. And it was in that capacity that I really came to understand just how well Melbourne caters for the sports fan. While Sydney, post the 2000 Games, has the legacy of Homebush it is totally disconnected from the heart of the city. Nowadays, for many attending a sporting event is more of a full-day experience. The trend is for patrons to often bookend the main event by calling into restaurants, cafes and bars. It also deposits fans at Flinders Street Station for ease of egress from the city. Likewise, Etihad Stadium provides easy pedestrian access to the heart of the CBD. As for the venues themselves it is hard to fault them. Few stadia in the world can match the MCG as a sporting amphitheatre. Thanks to constant, high-cost upgrades it has kept up with the times with respect to what the 21st century fan wants. On top of all that there is the Formula One street circuit and the Spring Racing Carnival which is held across three top-flight venues. 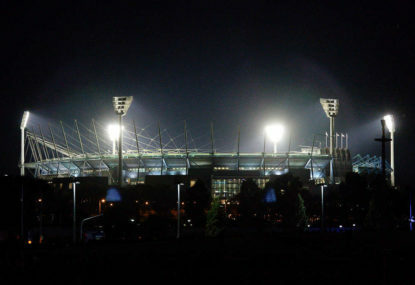 Collingwood FC president Eddie McGuire has publicly floated a $1billion plan that involves demolishing Etihad Stadium and building a new 60,000-seat, retractable-roofed stadium alongside the MCG. For over 25 years, successive governments and sporting bodies have tried to reach agreement on the future stadia requirements for the city while over that period band-aid measures have been undertaken at both Subiaco Oval and the WACA Ground. The result has been a sub-standard experience for the city’s sports fans. The bulk of the infrastructure is already there including most of the transport requirements. That can be said about few cities in the world.